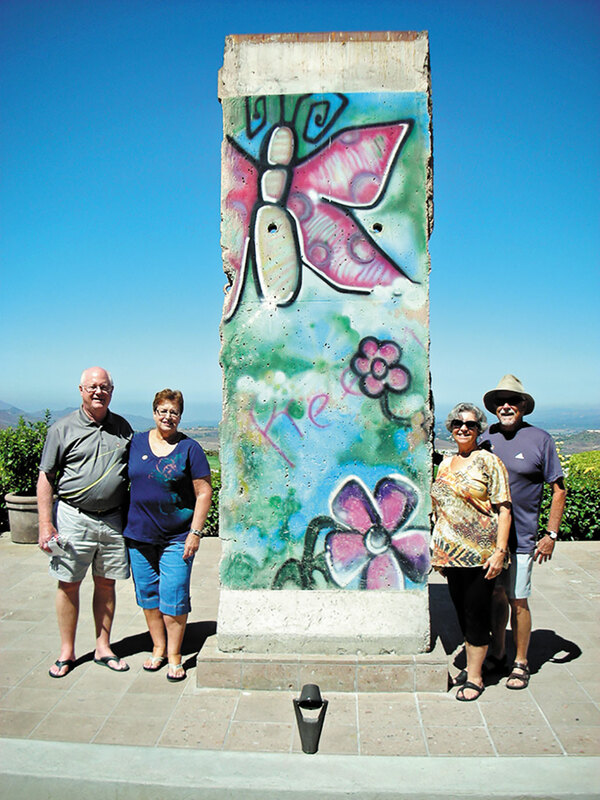 A piece of the Berlin Wall at the Reagan Library in Simi Valley. Left to right: Hap and Lynda Yoder, Jaine and Don Toth. They first landed in Los Angeles where they went to The Getty Center Museum, the La Brea Tar Pits, the Peterson Automotive Museum and Venice Beach. From there it was on to Carpinteria, Santa Barbara and a short jaunt up to Solvang, sometimes known as Little Denmark. Hap and Lynda enjoyed wading in the surf at Venice and Carpinteria beaches. Sites they took in included the Carpinteria Valley Historical Museum where the Toths served as docents for several years, visits to see two trees of historical interest, the World’s Largest Torrey Pine in Carpinteria and the World’s Largest Moreton Bay Fig Tree in Santa Barbara, and Cold Spring Tavern, a restaurant housed in the original building that was known as the Cold Spring Relay Station, a former stagecoach stop. Some time was spent at the Santa Barbara Courthouse, a must-see on every tourist’s itinerary.